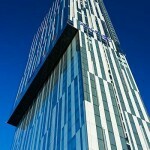 Okay, that was written in the 1850s because for 19th century grandeur Manchester is hard to beat. There are Classical meeting halls and clubs, Italianate cotton palaces, Gothic towers and spires, and Baroque banks – and all of it is stolen, stolen from grand European creations which hopeful architects had sketched on their Grand Tour and then reproduced across the city. The Gran Guardia Vecchia in Verona provided Edward Walters with a model for the Free Trade Hall; the St Mark’s Campanile in Venice was adapted by Thomas Worthington for the Police Courts on Minshull Street; Ypres Cloth Hall became Manchester Town Hall. In the 20th century the new architects adopted a similar approach, but this time it was the gleaming skyscrapers of Chicago and New York that enthused them. However those in charge of Manchester refused to let progressive architects such as Harry S Fairhurst and Joe Sunlight fill the skyline with granite and glass, and so Manchester missed out on one of the most exciting periods in building history. Restrictions on height eased after the Second World War but Manchester was – and still is – nervous of reaching for the stars. 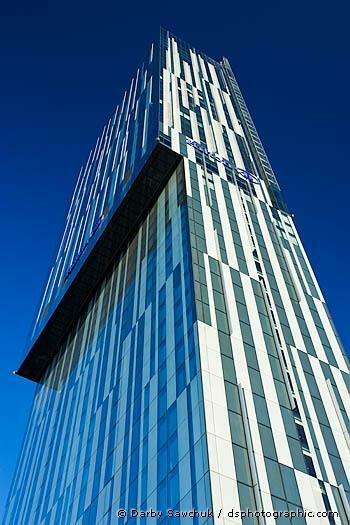 Beetham is our only serious tower, but it is a dwarf, a stripling compared to the glories that Adrian Smith, Chris Wilkinson and Renzo Piano are creating across the globe. We examine the city’s building legacy as we twist in and out of the city centre streets, straining our necks for a glimpse of a glorious Gaudi-like gable, a Venetian vista, a Greek giant order; a stroke of sacred geometry. Walk from here into Manchester and the finer detailing of these facades becomes sharper. Central Manchester is dominated by 19th century architects’ desperation to re-create the traditional styles of Europe – Greek, Gothic, Italianate, Baroque – on uncharted territory. 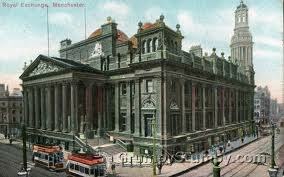 Manchester has few original buildings, just brilliant copies. The Memorial Hall on the corner of Albert Square and Southmill Street by Thomas Worthington is pure 15th century Venice. What’s left of the Free Trade Hall on nearby Peter Street is Edward Walters’ take on the Gran Guardia Vecchia in Verona. You want more Italy on the streets of Manchester? Head for the Athenaeum on Princess Street, now part of the art gallery, and behold a Florentine Palace that’s pure Palazzo Pandolfini by Raphael, while inside ironically is a large collection of Pre-Raphaelite paintings himself.